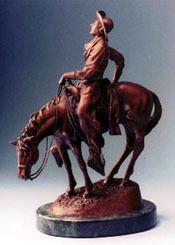 The vast prairies of the American West were first to hear the soulful and unique music of the cowboys, singing to his restless herds of longhorn cattle, while riding night guard on the open range. 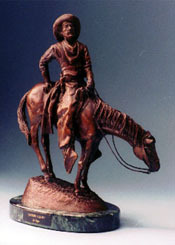 This bronze stands 14½" tall and 12" from nose to tail. It's mounted on a fine quality 2" thick American walnut base with a brass name plate and weighs approximately 15 pounds.You will be invoiced for the shipping charges prior to shipment.